Created as a peppermint candy in Vienna in 1927, PEZ, derived from the German word Pfefferminz (peppermint), is now a leader in "interactive candy." 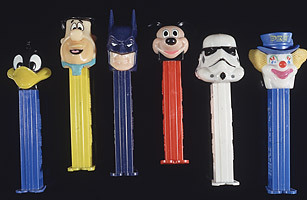 After the candy itself caught on, Oscar Uxa invented the famed PEZ dispenser in the 1950s, but he did not receive acclaim for his creation until heads were placed on top of the dispensers in 1955. Some of the earliest dispensers (Mickey Mouse, Santa Claus) can fetch up to $10,000 at auction. To date, more than 1,500 different dispensers have been created, and more than 3 billion PEZ candies are consumed each year in the U.S. alone.